Aptar Beauty + Home is proud to announce its first launch of a dispensing closure in Europe made from 50% Post-consumer recycled resin (PCR), confirming its leading position in the global transition to a circular economy and a sustainable future. Aptar’s comprehensive record in testing sustainable resins and knowledge of sustainable resin suppliers was key to Ecover’s decision to collaborate with Aptar. Ecover is the European market leader in sustainable formulations for household cleaning products; the launch of the custom flip-top closure in PCR resin for Washing Up Liquid products makes it the first major brand to use PCR resin in its bottles and dispensing closures. Aptar and the Ecover team are continuing to explore further opportunities to roll out PCR within the Ecover product portfolio. The successful development of this custom closure in PCR has cemented Aptar’s position as Ecover’s preferred partner for creating innovative and sustainable dispensing solutions. From the beginning of our collaboration, Aptar’s custom development team demonstrated to Ecover both its capabilities and professionalism. Aptar’s strong expertise in closure technology and proactivity in developing new concept designs was key to convincing this forward-thinking company to develop this exciting new project. With 40 years’ experience in creating sustainable household products, Ecover differentiates from its competitors through its consistent sustainable messaging combined with outstanding design. The custom-made flip-top PCR closure on Ecover Washing Up Liquid allows consumers to stand the bottle upside down towards the end of product life to ensure they get every drop out of the bottle. The bottle is made from 100% PCR resin and is 100% recyclable. Its new retro design harks back to Ecover’s heritage “Since 1979”. The easy-to-open cap is available in several colors. 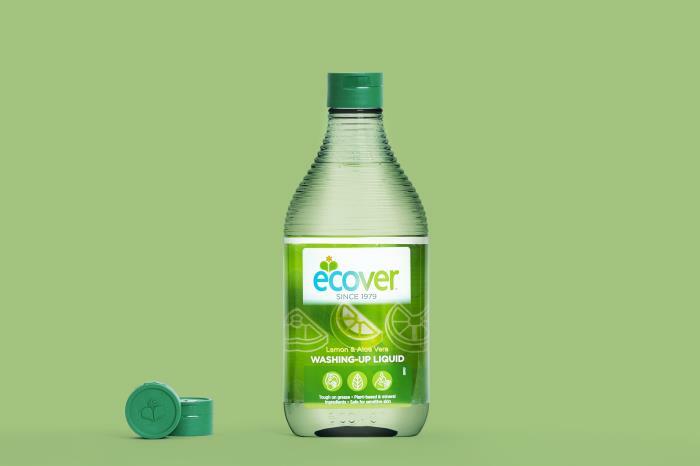 Far ahead of the competition in terms of both sustainable packaging design and product formulations, Ecover ensures its customers are washing their dishes to a sparkling shine while contributing to protecting the environment at the same time! E-commerce sales are projected to exceed $905 billion in the US and $5.8 trillion globally by 2022. With Disc Top GO, Aptar leads the industry with the first disc top specifically designed to withstand the challenges of e-commerce. Luigi Garofalo, Market Development Director EMEA Homecare at Aptar, tells us more about the trends sweeping the industry and, in particular, Aptar’s innovative use of insert technologies: “To provide novelty and delight consumers, we need to add value. Therefore, we invest a lot of time and energy in market research to grasp and capitalize on key areas of focus like e-commerce." Aptar Beauty + Home, the global dispensing company, launched IndieBoutique – a custom tailored program that offers Indie Beauty brands short lead times, stock color options, and low minimum order quantities on Aptar’s top-selling dispensing products. To make it even easier Indie brands can utilize the same level of dispensing expertise, industry knowledge, and technical support that Aptar provides to all customers. Expectations for innovation within the fast-growing baby care product market have translated into more safe, natural formulas and practical packaging. Packaging innovation, a driver of growth in the cosmetics industry, has skyrocketed in recent decades. As consumers seek out more natural products with clear, easily understandable ingredient lists, they are not prepared to make the switch to daily single use solutions. This means that packaging must pick up the slack! To meet the needs of a market using fewer and fewer preservatives, Aptar’s Skin Protect is an innovative and ultra-protective tube solution. Skin Protect offers consumers with sensitive skin a way to keep their product free of contamination over time using a practical, easy-to-use packaging solution. For its new high-performance skincare product, the luxury brand was looking for exclusive packaging that would both visually recall the cells of the hive and dispense two distinct formulas that could merge in the bottle pump. The result is a made-to-measure creation for this new serum and its bee seal stamped double pump bottle which dispenses the perfect amount of the brand’s antiageing corrective formulas with each actuation. Vitamin C, already well known for its energizing and anti-oxidant virtues, is back front and center in the cosmetic world in ultra-concentrated formulas. Vitamin C has been able to make a comeback thanks to new innovations in packaging that help stabilize this fragile active ingredient. In the field of cosmetics and dermatology, consumers’ subjective concerns are crucial. Consumers have certain expectations when it comes to texture, color and fragrance, and packaging plays a major role in ensuring product quality. Aptar conducts qualitative studies to create packaging solutions that meet market needs. Skin Protect has undergone microbiological lab testing to ensure its container remains airtight to prevent microbial contamination through contact with air or skin. Applying perfume is a way of asserting oneself, expressing one’s personality, one’s singularity, existing socially, either by allowing a trail to blossom, or more intimately when the fragrance lingers close to the skin. For women with cancer, this simple gesture is often impossible, prevented by the treatments which affect sense of smell or scars that do not allow the use of sprays. For the launch of the first perfume designed for these women, the Ozalys brand has chosen Aptar Beauty + Home and its NOTE system. Driven by the growth of preservative-free and clean cosmetics, organic products are boosting their market share. While still considered a niche market, sales of organic personal care products are growing at 10% a year and are expected to account for more than US$25 billion by 2025! However, many consumers have found themselves confused between these products and those called “natural”. “Paraben-free”, “allergen-free”, “preservative-free”… these negative claims will soon belong to the past thanks to stricter European regulations on this type of statement. Here’s how that will work. At a time when “preservative-free” products are in high demand, filling poses a crucial challenge for product manufacturers because the process needs to protect the formula from the time it is packaged. Learn more about our solution to ensure product integrity before it hits store shelves. With urban pollution worsening and aggravated by climate change, consumers have become more aware that they need to protect their skin from the harmful combined effects of UV rays and fine particles. Brands have started addressing this need with “shield” formulas. If our gut is our “second brain”, our skin flora is the natural shield for our skin! Formulas enriched with pre- and probiotics are becoming more widespread and promise a more natural approach to skincare. Just like the agrifood industry, the dermocosmetic sector is experiencing a real paradigm shift. The trend is leaning towards cleaner, preservative-free formulas. Please welcome “clean cosmetics” – a phenomenon that can be explained and interpreted in the following three ways. Skin Protect is a revolutionary airless packaging designed to dispense and preserve any kind of fluid. It offers an extreme protection against all types of external contaminations. A three-point ventilation of the overcap prevents any surface moisture or air containment. The tubes are submitted to heavy tests against microbiological contaminants, in both dry and humid environments, and in both static and moving positions. CLEAN Reserve is sampling the Avant Garden Collection using Aptar’s Easy Spray and Clip Card. Easy Spray is Aptar’s most widely used sampler, with a metal free product path, discreet dip-tube and available in 1.5 and 2ml. There is a way of applying perfume to match any personality, culture or occasion. Aptar Beauty + Home is always inventing new application methods, with sprays ranging from the traditional to the ultra-sensory. Today, Salvatore Ferragamo has chosen Aptar to offer the ideal spray for its new fragrance, a bold and rebellious Floral Oriental. Uriage chose Aptar Beauty + Home’s Auriga City airless solution to effectively protect its AGE PROTECT range, whose multi-action formulas combat both the signs of ageing and external aggressors (pollution, stress, blue light, etc.). A logical step as it needs to preserve highly sensitive formulas intended for fragile skin. Artisanal perfumer Carlos Huber introduces two new fragrances to the Arquiste line: Esencia Del Palacio Limoneros and Esencia Del Palacio Guayabos using Aptar Easy Spray 1.5 ml vial on card fragrance sampler. In the past, sexual well-being products such as personal lubricants and vibrators were perceived as inappropriate and immoral. Those days are long gone. The sexual well-being market is growing every year, thanks to a growing acceptance and a change in perception by the end consumer. In partnership with Precise Plastic, Aptar leveraged its expertise into a custom solution using a PAV/U pump for the 10ml on-the-go pack, for her. Aptar beauty + home is driving sustainability by launching closures made of Post Consumer Resin (PCR) and the first dispenser pump made of bio-based material. The first tangible outcome from Aptar's strong commitment to sustainable materials is the recent launch of Aptar’s tube top, snap top and disc top closures made of PCR resin. Valvoline set out to make changing oil easier, faster and cleaner for users of its Do It Yourself “DIY” motor oil products with their new, highly functional five-liter “Easy Pour Bottle” package. An exceptional user experience was at the heart of the bottle’s development, as Valvoline invited consumers to share feedback throughout the process, which was used to inform the most user-friendly package design possible. Aptar launched SheerMist – the new mechanical break-up insert that creates a gentle, fine mist spray. The SheerMist insert provides key benefits* to consumers including a soft, uniform and quick drying spray – the result of low spray flow rate and fine particle size dispersion. By reproducing the product’s application experience on a smaller scale, Aptar Beauty + Home has transformed a promotional tool into an engaging experience that delivers Yves Saint Laurent’s luxurious, design-forward world to potential customers, staying true to the original product and offering an incentive to buy. To allow Yves Rocher to develop its ultra-concentrated I Love My Planet Shower Gel, Aptar Beauty + Home devised a custom SimpliSqueeze closure with superior dispensing control that improves consumer convenience and reduces environmental impact. Brands nowadays, are faced with the challenge of providing dispensing that ensures the integrity of the contents. A new generation of sprays, like Aptar's La petite, provide perfect olfactive neutrality – meaning that the fragrance is never in contact with components that might modify even the most subtle notes of the perfumer’s original creation. Sleek, refined design, unique, high-precision application: Aptar Beauty + Home helps promote the pioneer of personalized cosmetics by tailoring its packaging solution Serumony to IOMA, the expert in custom skincare. If Double Serum is unquestionably the Clarins brand’s iconic product, it is because it is made up of the best scientific and technological formulas. Aptar Beauty + Home, the pick of the innovations presented at the LUXE PACK MONACO 2017 trade fair! Aptar Beauty + Home, worldwide leader in fragrance and facial skin care packaging delivery systems (sprays, aerosols, pump bottles, etc.) supports brands throughout the project process from design to creation, drawing on its accurate knowledge of trends and new consumer habits.